I kind of want to open this post like a stereotypical high school speach. "Websters Dictionary defines perception as...."
But that's lame. We all know what perception is. And perception is only valuable to talk about in relation to how it's often opposed to reality. Perception is reality, right? Except when Matt and I get into fights because I think he's being insensitive and he has absolutely no idea why I'm upset. My perception of events is different than reality, most of the time. But that's a topic for another post. I was totally doing nothing wrong, have character witnesses to verify this, but the way one person stated the issue, it made it seem like I was being dishonest. This whole situation caused me a lot of stress. I don't interact with many of the influential people at my company often because I live many states away and work remotely. Their ability to judge the merit of this rumor is hindered by their limited exposure to me and my true character. After hearing about this, I was really sad, disillusioned, and feeling like this dumb, untrue thing was going to tarnish my image and hinder my career. It was really lame actually, how insignificant the rumor even was, but my company is led by very conservative people with a long memory. For example, every time one of my colleagues is mentioned, the gossip about this one time at a training conference 3 years ago is brought up. It definitely makes him look bad, and I have been one of the many to say "wow that is crazy, I can't believe people would behave that way on a work trip." Now this situation makes me wonder, are people saying that about me now? Especially because I put so much work into what I do, and how I'm perceived. I put in extra hours, extra effort, extra care all the time. To feel like the last three years of hard work could be undone by something untrue was really unfair. After some time has passed, my feelings have leveled out. But I feel that a lot of it has to do with my purposeful change of mindset. People can have a perception of me, and my character, all they want. Ultimately, I know the reality. I know that I conducted myself with integrity and that is really what matters. I really believe that, if you do the right thing, that will eventually be clear to anyone that counts. I often overanalyze things. Like last weekend, when I hung out with a group of friends and had a couple drinks. I come home and think, did I say anything dumb? Was I insensitive? Or when I get off a conference call and wonder, did I not speak up enough, or did I say too much? I've decided to try and let these things go. I am who I am, and though I consider myself always a work in progress, and am definitely not perfect, I can't constantly second-guess myself. I'm ok with who I am, and the decisions I make. I'm a person with good intentions, and a lot of hard work and care to back that up. Do you overanalyze your actions and words all the time? 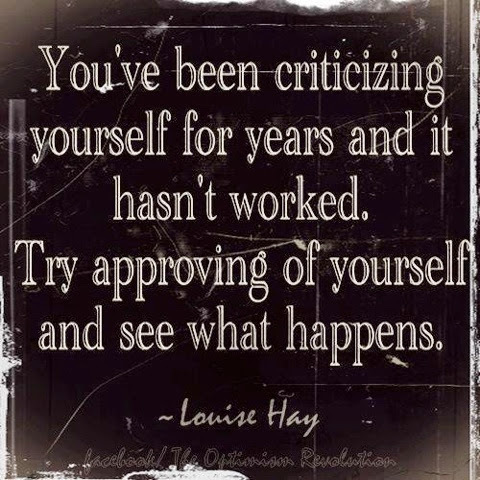 Have you ever tried to stop that negativity?